Along the bicycle and foot path, in the section between Vilshofen and Winzer, directly on the outskirts of the Danube, the Danube Planet Trail was installed a few years ago. At the Vilshofen Harbor is the giant orange-yellow ball that represents the sun. From here one can reach the first planets in walking distance. 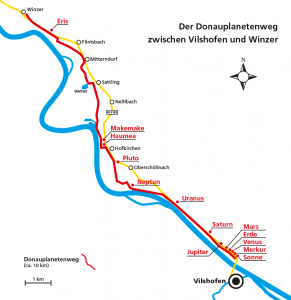 The Danube Planet Trail is a static model of our solar system on a scale of 1:1 billion. This scale applies to the distance of the planets from the sun as well as the size of the model sun, eight planets and four dwarf planets. 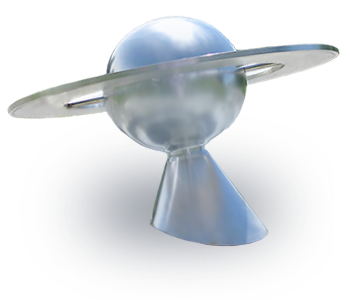 All planets are represented as 3D-models along the bike and foot path in the order of their distances from the sun. The model of the sun is in Vilshofen Harbor. From there you can either walk or ride by bike from planet to planet. The respective distances from the model of the sun to each planet are given below. At each station is a plaque with information about that respective planet. With a smartphone or a tablet you can play an audio commentary by scanning the QR code on the plaque – or you can listen to it in advance under Downloads. Around the Danube Planet Trail you can also go on interesting bicycle tours or walks and get to know the beautiful surroundings of Vilshofen.